On the String Challenge front…. For those of you who have been following along with me, you know that I’ve challenged myself to finish all of the quilts in Bonnie Hunter’s new book String Fling before her new string book comes out. As of now I have three quilts left to make…. I told you that I was sick last week…again. Before I ended up on the couch for some rest I managed to get all, as in EVERY LAST ONE, of my Pineapple Crazy blocks sewn!! I was so happy. I stopped and snapped a picture of the last block on the last stitch. If you’ve made this quilt…you would understand why them moment needed to be memorialized. After that, it was time to trim and de-paper. I love my little square ruler for squaring up. I use it a lot! Over the next two days, Hubby and I went to a garage sale. I grabbed the blocks and de-papered in the car. He drove me to the doctor and I de-papered then too. Once home from the doctor I was banished to the couch but decided that my Pineapple Crazy blocks were going with me. I de-papered and watched an episode on Netflix. That’s all the time I needed to finish my de-papering and there it was….My 60 border blocks finished!! I am so excited!! I’m hoping next week I’ll have them all sewn together and attached to the center. I’m pretty much possitive that will be happening. I am too close to a top to not keep pushing through to the end. 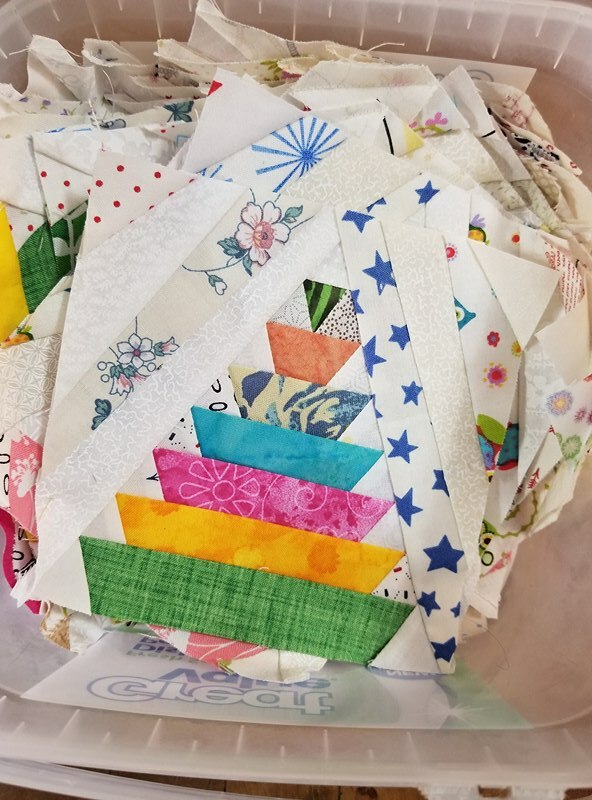 Before I go, last week I commented that I use tracing paper for my paper pieced blocks. For me, it’s essential. I tried paper piecing on regular paper and it was terrible. Tracing paper made all the difference for me. I can hold the paper up to the light and see where the seam is going to land once I sew it. Tracing paper is a must as far as I am concerned. I had people ask questions about it…. I got mine at Dollar General. I got it a year or so ago. At the time I bought up all they had. I’m not positive it’s still available. It is available other places for example here is some from Amazon. Another question I got was if it was hard to get to go through the printer. First off the pages have to cut down to regular paper size. The tracing paper is 9 x 12 and regular printing paper is smaller. It doesn’t feel through the printer as easily as regular paper but if you attend the printer, it’s possible. I recommend only putting five or so pieces of paper into the printer at a time. Occasionally the printer will grab two sheets as the paper is so thin. It’s do-able with my cheap HP printer. Stop back next week…I’m hoping for a finished quilt top!! This entry was posted in Bonnie Hunter, String Challenge on February 12, 2018 by Jo. In Bonnie Hunters post yesterday, she said her next book will be available in December 2018. You’ve got 10 months left to finish the last 3 quilts! As fast as you work, you’ll make it. In December you should make a post showing all the quilts from String Fling that you’ve made. Congratulations! You are speeding along! Way to go, Jo! Hope you feel better real soon. UGH on being sick. This winter has been terrible for all kinds of ‘bugs’. As far as my project. “On Ringo Lake” is in hibernation. I had four quilts going on at one time and that’s just two too many. So at least one of them needed to be put on the back burner. I’ll get back to it, I’m sure. I’m also doing your BOM (only mine is one a week), so that’s bumped up the queue to the top. I got one of the oversized blocks done this weekend, and another should be done sometime this week. I love the progress on the BOM project and want to speed up on it! I hope you are finally on the mend and you are getting close to a finish on the pineapple top. I’ve wanted to do Pineapple crazy, but I wasn’t sure I could get an accurate Xerox of the foundation because of it’s being in a bound book. I’m afraid the image would be distorted. The foundation for the border blocks is very near the gutter of the book. I don’t see how I could accurately scan it since the page wouldn’t be flat. What did you do? Did you cut that page out of the book? I’ve had my book spiral bound. It can lay flat. No string piecing happening ,we’re away on vacation . Brought some hand sewing to do but that’s it .